A product of the Brussels and Amsterdam music scenes, Loden's productions blend M83's wall of sound, Air's Virgin Suicides score, and City Centre Office's ever-expanding supply of laptop electronica. After some net-label work and a 7-inch for Eat This Records, Loden hit his stride with the 2003 EP, All That's Left Is Right, which was released in Europe and subsequently licensed by Mush for the rest of the world. 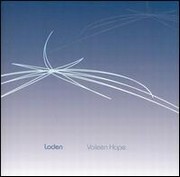 Valeen Hope, Loden's first full-length release, displays a quantum leap in his confidence as a producer. Across twelve compositions of singularly beautiful shoegaze-inspired electronic work, rays of early '90s pop melody shimmer through layers of deconstructed beats and oceans of ambient synth noise. Valeen Hope's majestic sheaths of sound has drawn comparisons to contemporary artists like M83 and Air, and even the mighty My Bloody Valentine. Written as Loden was traveling between Holland and his native Belgium, the album deals in emotions often suppressed in beat-driven music; digital sounds are skillfully manipulated to convey feelings of longing or discovery. With a sound that is deep, airy, and just noisy enough to keep you guessing. Valeen Hope is a stunningly mature album from one of Mush's most promising young producers.